Have you ever noticed ads with headlines like, “Lose 25 Pounds in Only 2 Weeks!” or “Burn Fat Without Changing Your Diet!” or “Reach Your Weight Loss Goals FAST”? Whether the ad is for a celebrity diet, a juice cleanse or herbal supplements, it usually claims the product is “clinically proven” to boost metabolism, burn more calories, build lean muscle mass, etc. to help you lose weight. The thing is, advertisers that claim their product will make losing weight quick and easy without changing our lifestyle or behavior are deceiving and misleading us. They play on our insecurities about our bodies. Why else do these ads always show young, fit people who look like super models? They want to convince us that they hold the secret to a new, sparkly, shiny life and if we pay $59.95 in three easy payments, we, too, will be in on that secret. Bad Idea #1: Drink 4 raw eggs in the morning. I figured if it worked for Sylvester Stallone in “Rocky,” I’d give it a shot. I slurped down those raw eggs five mornings in a row. By the fifth morning my body sent me a message loud and clear, “This is a bad idea.” I had a screaming case of salmonella poisoning and the worst stomach ache EVER. Bad Idea #2: Order diet pills from an infomercial. These pills were supposed to boost my metabolism and burn fat automatically – without me doing anything. Well, something did burn – a hole, right through my wallet. What’s worse, instead of losing weight, I actually gained weight, rapidly. So, not only did it hurt me financially, it hurt me physically because that rapid weight gain affected my kidneys. 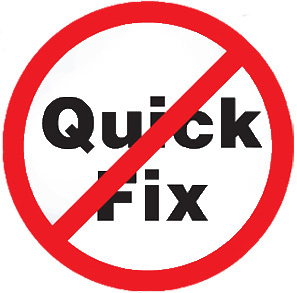 The truth is, there’s no quick fix. There’s just hard work. Lots of it. One of the things that makes losing weight and getting healthy so hard is that it requires us to change. And let’s face it, change is hard. The hardest, and scariest, thing I had to face was that my obesity had become a serious health problem – even life-threatening. The cold, hard facts were right in front of me, but I still struggled with emotional and psychological barriers that prevented me accepting the truth and taking that first step. Eventually, I realized that while I wanted to change, I didn’t want to do the work. You see, I was still hanging on to the thought that somehow, there was a quick fix. It took a while to shake that thinking and replace it with this: If I wanted a quality of life and if I wanted to live as long as possible, I needed to change. The choice was mine. When I was ready to take that first step, the ground beneath my feet was solid as I stepped with determination, sure of the choice I’d made – a better life for myself. After being diagnosed as a type 2 diabetic and weighing 420 pounds, O’Neal Hampton Jr. became a contestant during the 2010 season of NBC’s "The Biggest Loser." It was then that he was introduced to NuStep. Through the O'Neal Hampton Wellness Foundation, he educates others on the value and importance of exercise and nutrition. O’Neal Hampton Jr. is a NuStep spokesperson.